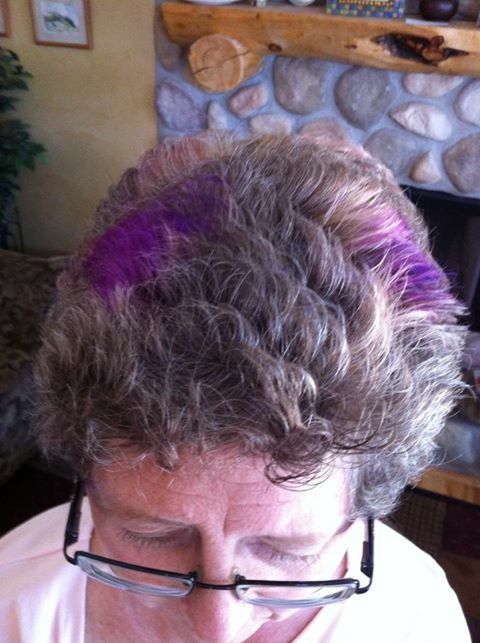 I willing allowed 2 young women to bleach sections of my hair and then dye it purple! Why would a conservative person such as me do such a thing? The answer is simple, because I care about building a relationship with these young women. You see, they are my granddaughters and trusting them to do this spoke volumes about my feelings for them. When first asked, my thoughts were conflicting. Part of me thought it would be fun. The other part argued that it might look ridiculous and someone like me just didn’t do this sort of thing. Deciding to be spontaneous, I went for it. Although it didn’t turn out exactly as I had imagined, I am enjoying the comments I receive! When one person asked me about the colour in my hair, I jokingly said that our children may have made us grey but our grandchildren make us much more colourful. As soon as the words were out of my mouth, I realized how true that was. In the business of life we tend to let the colourful, spontaneous part of ourselves fade away. By the time our grandchildren come along, we don’t have the same pressures so can relax and allow ourselves more time to have fun with them. This is when we rediscover the joy to be found by stopping to explore everything around us. For someone who normally likes to ‘play it safe’ my impulse to try something different has been a big eye opener for me. Wanting to be sure that I make the right choice has often been paralyzing for me. Not long ago, when I was putting off a decision, I confessed to a friend that if I didn’t decide, then I couldn’t fail. As soon as I said it, I knew that was wrong. By not making a decision, I am failing. If things turn out in my favor, it was a good choice. If not, it’s a learning experience. In either case I am moving forward. God did not give us a spirit of fear but of trust. I trust him to guide me. He can take any mistakes that I make and turn them into something he can use. What a great example of living outside your comfort zone Tandy — thanks for the inspiration. Thanks Louise. Who knows what else I can do? As your daughter said, until I did it, I didn’t know that I could! Tandy, this is very powerful! I love it. Thanks Kimberly. My purple hair has faded to pink, but I still like it! We love that hair, Tandy. Thanks. It’s funny how something like purple in my hair makes me feel young and adventurous!